Getting more nutrient-packed foods to nourish our pint-sized learners should be parents’ No. 1 lesson plan for health. With kids back in school, now is the time to stock up on healthy foods for their lunch boxes (or bags) and after-school snacks. Since 98% of children fail to meet the recommended servings of the five core foods groups—and some 25% of children’s daily calories are from junk foods like soft drinks, sweets, and desserts—getting more nutrient-packed foods to nourish our pint-size learners should be parents’ No. 1 lesson plan for health. As a dietitian, I can rattle on for hours about research that shows how children with healthier diets perform better in school, sports, and social environments. Here are some ideas and guidelines of how parents can make perfectly packed lunches and great after-school snacks. A serving of whole grain to maintain focus and concentration. Healthy options include whole-grain bread, pasta, English muffins, tortillas, and frozen waffles. A source of protein for staying power. Healthy options include lean deli meats, peanut butter, 1 ounce of nuts, 1/4 cup of hummus, and tuna. At least one serving of a fruit or vegetable for vitamins, minerals, and antioxidants. Healthy options include whole fruit, fruit kebabs, fruit cups packed in their own juice, raw vegetables with dip, and 4- to 6-ounce 100% juice boxes. Nonfat or low-fat dairy for protein and bone-building minerals. Healthy options include nonfat or low-fat yogurt, milk, and cheese. 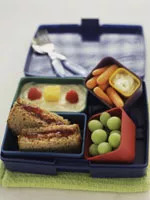 If you want to include dessert in your child's lunch, opt for a treat that's no more than 100 to 130 calories. Great options are cereal bars, whole-grain energy bars, or whole-wheat fig bars. Dark-chocolate-covered dried fruit is a better option than a milk-chocolate candy bar. Need some inspiration? Get the week started with this recipe, and branch out from there.